I can’t remember the last time I made a port-Rey-t out of food. However, when Dave and Joely brought “Rey’s Krispies Treats” to our Star Wars party, I’m af-Rey-d I simply couldn’t ref-Rey-n myself from taking their idea, and making one of The Force Awakens heroine. I p-Rey they forgive me for appropriating their punny name! The Rey-cipe is simple and pretty st-Rey-tforward. The port-Rey-t didn’t take very long to make, but since the kids “helped,” the kitchen was in total disar-Rey when we were done. Oh well! 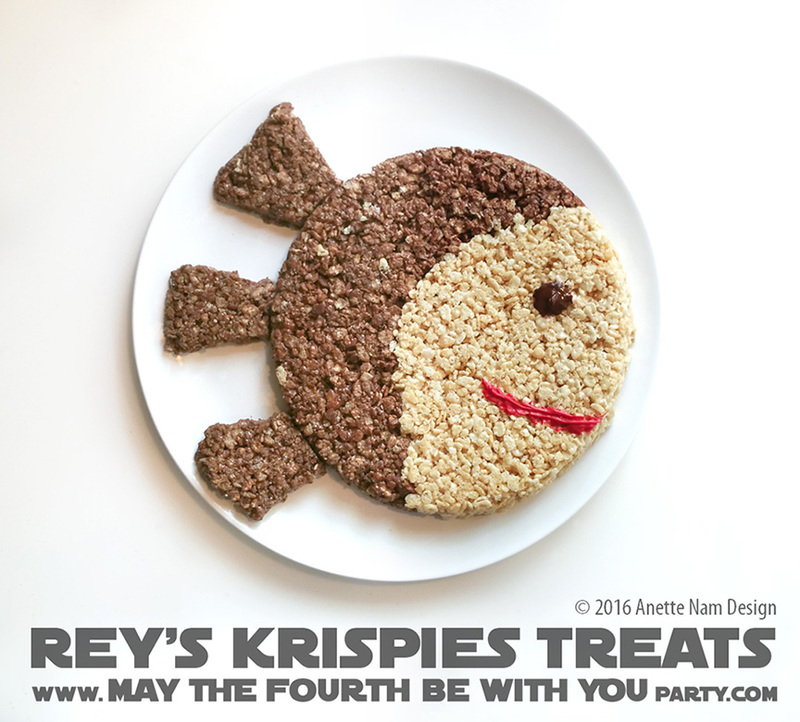 Despite the mess, I totally recommend making a t-Rey with Rey’s Krispies Treats for your next Star Wars Party! Your guests will all holler “What a g-Rey-t idea!! !” Add a few princess Leia Buns st-Rey-t from out of the oven, and an ar-Rey of Imperial S’mores, and I’m sure they will Rey-t your “Dessert Planet of Jakku” display (post to come) at least an 8. Lightly sp-Rey pans with cooking sp-Rey. Put half of the marshmallows in each pot, stir until melted. Throw in a handful of chocolates chips in to the batch that will be used with the Cocoa Krispies. In 1 bowl, mix the regular Rice Krispies with half the marshmallow mix, in other bowl, mix the Cocoa Krispies and the other half of the mixture. Form the face in the round pan…make sure the mixture is cool to the touch…you’ll need to use your hands. Add the chocolate mixture and form the hair. Put the remaining mixture in the rectangular pan. The chocolate left-overs will be used for the Rey’s buns, the white… for snacking. Once cooled, turn over the pans – you want to use the bottom side up. Cut the buns from the left overs it he rectangular pan. Melt some chocolate and candy melts and draw the eyes and mouth with a chopstick. If you want you can melt a few marshmallow in the microwave and use that as a gel to keep the buns in place. Then, once they are Finn-ished, be sure to share with all your f-Ren-ds! The hardest part when making these is to rest-Rey-n yourself from taking a sample bite or 2. This is easiest to make with 2 people. One that mixes the the ingredients, and one that melts the stuff, and presses the mixture into the molds. This stuff hardens quickly!